On Friday 11th November, Jeff Beck was honoured at the Classic Rock Awards. Childhood friend Jimmy Page was on hand to present him the evening's highest accolade, The Icon award. 'I usually went to visit Jim because he had the equipment. He had a wicked collection of about 400 albums, whereas I only had about four. The blues kept us going.' - Jeff Beck in BECK01. While Jeff Beck was in Japan for the awards ceremony, his new book, BECK01, was introduced to readers at BookMarc, Tokyo. To celebrate Beck's Icon Award, for a limited time every purchase of BECK01 includes a signed book plate from BookMarc, and a 12-inch copy of Jeff's new album, Loud Hailer. Order now and you can also be a part of our prize draw. 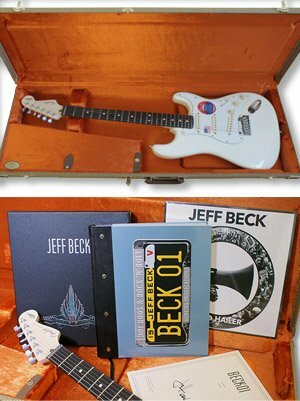 Every Genesis reader ordering a BECK01 limited edition book in 2016 is in with a chance to win a Jeff Beck signature model Fender Stratocaster. The winner will be selected at random and announced in January 2017.